Observing Earth from 400 kilometres (250 miles) away has made astronaut Thomas Pesquet aware of the planet's fragility as never before, he told AFP from the International Space Station days before heading home. While on terra firma politicians argued over a pact to preserve Earth's climate for future generations of humans, the Frenchman had six months to contemplate the planet from an unfamiliar vantage point. "There are things that one understands intellectually, but which one doesn't really get," the 39-year-old said via video link, gently floating around in the zero gravity of space. When it comes to global warming, "we talk of two degrees (Celsius) or four degrees—these are numbers which sometimes exceed human understanding. "But to see the planet as a whole... to see it for yourself... this allows you to truly appreciate the fragility." Throughout the interview Pesquet drifted in a room full of machines, gadgets and wires—the French and European Space Agency flags stuck to a wall behind him. Until you see it from far away, "one doesn't really appreciate how thin the atmosphere is, to what extent we are capable of destroying the planet—to what extent we need to protect it," he insisted. Pesquet, Russian cosmonaut Oleg Novitskiy and American Peggy Whitson arrived on the ISS on November 20 for a six-month mission. Since then, Donald Trump has replaced Barack Obama in the White House with promises of pulling America out of a hard-fought global pact to limit global warming. The goal, outlined in the 2015 Paris Agreement, must be achieved partly by curbing greenhouse gas emissions from burning fossil fuels—an industry with a strong voice in US politics. These gases accumulate in the same atmosphere Pesquet observed from afar, and act almost like a blanket to trap the Sun's heat on the surface. Pesquet and Novitskiy are scheduled to return to Earth on Friday. He will be "a bit sad to leave," the Frenchman said, deftly twirling a microphone between his fingers with the aid of weightlessness. But at the same time, he will be happy to hug his girlfriend, see family and friends, go to the beach, walk in the mountains, and feel a breeze on his face. The food in space, he said, "is not great", and going to the toilet "is more camping than five star." "I feel ready" to go home, Pesquet declared. "My suitcase is ready." 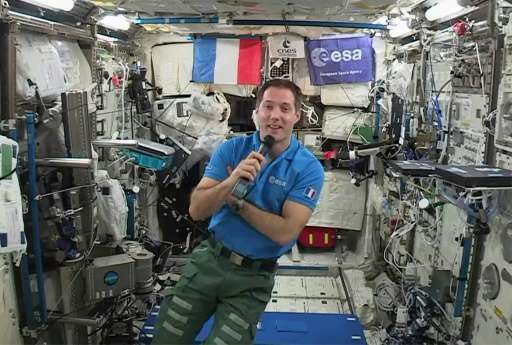 Pesquet, France's 10th ISS astronaut, has become a bit of a social media celebrity at home, with more than 550,000 followers on Twitter where he frequently posted photographs of Earth from space. "The planet is truly a jewel," he said on Tuesday. "We must not take it for granted." "burning fossil fuels—an industry with a strong voice in US politics." Too strong a voice for what is supposed to be a democracy. Jewels are usually pretty rugged. Perhaps a better analogy would be a pretty Xmas tree ornament heirloom. Sooner or later you're gonna drop it so you ought to have a bunch of them just in case.